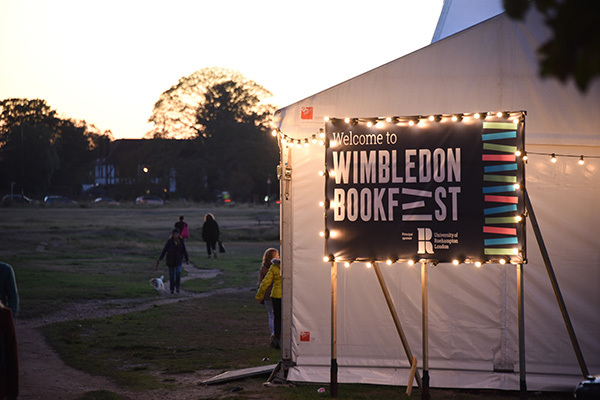 Wimbledon BookFest is a charity promoting arts, culture and education. Its aim is develop the cultural offering for the locality through provision of an annual arts festival and educational projects with schools and young people. It was founded in 2006 by Fiona Razvi and Tony Kane whose ambition was to develop arts and cultural across the community. The public festival takes place in early October in a 'pop up' festival site on Wimbledon Common in its Baillie Gifford Big Tent and William Morris Tent. The Festival also runs a year long Education programme with schools. It hosts almost 100 events in its 10 day period and has grown from 1,000 visitors in its first year to over 15,000 with 7,000 school children from over 70 schools now enjoying the festival every year. Any money raised is ploughed back into the festival and its education work with local schools. Over 2,000 books are given to children from a lower socio-economic demographic every year to encourage reading. Central to BookFest is the desire to bring literature to the heart of the community and the community to the heart of literature. It has a large volunteer input and a small team of core workers.